Published by: Electric Monkey (Egmont). Official synopsis: "The most breathtaking and exhilarating ride you will take this year, this is the first in an incredible new action thriller series from Michael Grant, author of "Gone". These are no ordinary soldiers. This is no ordinary war. Welcome to the nano, where the only battle is for sanity. Losing is not an option when a world of madness is at stake. Time is running out for the good guys. But what happens when you don't know who the good guys really are? Noah and Sadie: newly initiated to an underground cell so covert that they don't even know each other's names. Here they will learn what it means to fight on a nano level. Soon they will become the deadliest warriors the world has ever seen. Vincent: feels nothing, cares for no one; fighting his own personal battle with Bug Man, the greatest nano warrior alive. The Armstrong Twins: wealthy, privileged, and fanatical. Are they the saviours of mankind or authors of the darkest conspiracy the world has ever seen? The nano is uncharted territory. A terrifying world of discovery. And everything is to play for..."
I actually finished reading BZRK a few weeks ago, but I wanted to take some time out to just think about it before I actually wrote my review. It's going to be tough to review, but I'll try! 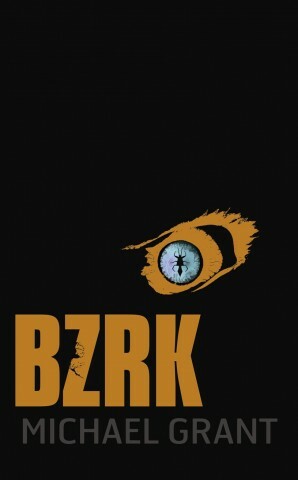 BZRK is probably the craziest, weirdest, frustrating, sickening, chilling and mind-boggling book I have ever read. And upon reflection - I love it. At first, when I started it, I wasn't sure at all - the openning scene had me wondering if it was really my kind of book. However, I persevered. Once you get past the fact that some words are tongue-testers and take a couple of goes to actually pronounce them correctly, or hopefully correctly..., then what you have here is exactly what the synopsis promises. A breathtaking and exhilarating ride. Right from the start (which I want to talk about so much, but don't want to spoil, sets the tone brilliantly!...) we get the sense that the forces we're seeing here aren't all that together in the head. They're twisted and will do pretty much anything they can to achieve their goals - and they think there's nothing wrong with it. Classic baddie, right there! Two rival groups are at war. Both have nanotechnology and use it to varying degrees. One group are trying to take down the worlds leaders, so that they can bring about their vision of peace and unity - a vision that I'm not sure many others would actually share, and then of course the other group. BZRK. They are trying to stop them. The writing is so rich, and so fluid. I had read some of Grant's work before. The first few Gone books, and whilst I thought they were great reads, BZRK takes the reader to a whole new level. With nanotechnology - nanobots, biots - mind control, murder, sanity, insanity, drugs, it's a hard hitting read and one that I just cannot stop thinking about, even now a few weeks on. Grant has a way of just hooking the reader in. It's well paces, some parts go a little slower than others, but when the action picks up, it more than makes up for it and smooths the whole thing out. We meet an array of characters too. Bugman. Sadie. And of course our baddie! Benjamin and Charles Armstrong. Conjoined twins. Their thoughts are as creepy as their appearance - I for one wouldn't like to meet them in person! I'm not really sure what more I can say. I hate spoiling books for people, and when books are as tautly-woven as this one, it's hard to say pretty much anything. All I will say is that it's a stunning book, that at first glimpse might look like your ordinary Sci-Fi thriller, but ordinary it definitely is not. Just got to pass the very long wait now for the second book in the series, due early next year!